The deadline for submitting papers to CHItaly 2019 has been extended to April 15th, 2019. A great chance to submit your research to CHItaly! You can find the updated call for papers on the conference website. Follow the updates on Twitter! The inaugural event of the Polisocial 2017 “LudoMi” project will be held in Monday 1st April 2019, the day before the World Autism Awareness Day. LudoMi is a project funded by Polisocial, the social responsibility program of the Politecnico di Milano, and it aims to create new innovative and inclusive educational services, with a particular focus on children with intellectual disabilities in the Milanese suburbs. In LudoMi two Magic Rooms have been designed and developed (interactive multi-sensory “smart” play spaces), installed in two schools in the town of Cornaredo. Their experimentation is underway. Additional description, content and videos are available on the LudoMi project website. 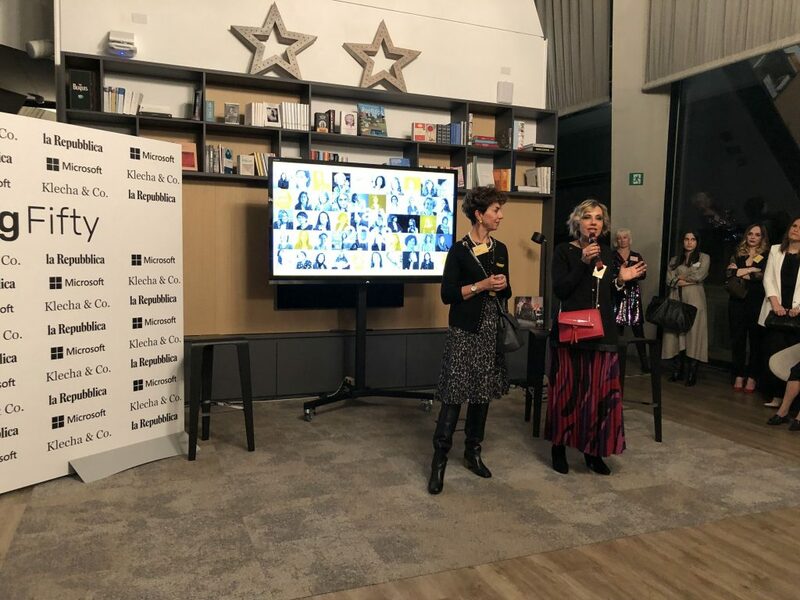 Tiziana Catarci, one of the SIGCHI-Italy founding members, is among the Italian “InspiringFifty”(https://italy.inspiringfifty.org/), 50 women who distinguished themselves in the innovation field and that may be considered as landmarks for the ambitions of younger women (and men). Tiziana has been awarded in Milan on January 22nd. In 2017 she became a “Commendatore della Repubblica Italiana” one of the most important merit title in Italy. This edition of the Biannual Conference of the Italian SIGCHI Chapter will be held from 23 to 25 September 2019 in Padova. The Chapter is an active community that brings together people working on the design, evaluation, and implementation of interactive computing systems for human use. The conference is open to both members and nonmembers, enlarging the participation to scholars working in the Mediterranean and central European countries, stimulating the debate in the research and design community. designing persuasive, motivating, empowering technologies that increase awareness of health issues and motivate to positive life styles. All submissions must be in English and contain original work not published elsewhere. The Doctoral Consortium (DC) is a special session of the conference where a limited number of PhD students can receive some expert feedback on their work. Applications to participate must describe the research questions, the project position with respect to the state of the art, the research plans and methodology, as well as the ideas and results achieved. Posters are descriptions of small studies/experiences, or of recent study insights of works still in progress. Posters will be displayed and presented during a dedicated session of the conference, and will have a 1 minute presentation slot in one of the plenary sessions. In order for accepted posters to be displayed, poster presenters are required to register and be present during the poster session. Posters, and DC proposals are 2-page word abstracts in the ACM template and pdf format, references included. Accepted posters and dc proposals will be included in the adjunct proceedings volume (not published by ACM). Workshops are small meetings on a dedicated topic; tutorials are small courses on a specific tool or technique. Candidate organizers can submit their proposal as a 2-page description in pdf format including the name of the organizers, affiliations, motivations, organization, expected outcome, duration, material. Upon approval, the workshop/tutorial will be devoted a dedicated space on the conference website, and its description will be included in the adjunct proceedings (not published by ACM). A limited number of slots are available. To propose a demonstration of an interactive prototype during the demo session, developers can submit a 2-page description of authors, affiliation, status of implementation and deployment, goals, equipment brought/needed. For demos of commercial products, please contact the organizers to participate as a sponsor. Long and short papers are to be submitted online via EasyChair (https://easychair.org/conferences/?conf=chitaly19). Awards to the best paper, poster and dc proposal will be granted. Fabio Paternò, one of the senior members of the SIGCHI-Italy, just released an interview for the People of ACM European Chapters Bulletin. The organizers Luciano Gamberini, Fabio Pittarello and Anna Spagnolli have announced the location and date of the next CHItaly, which will be held in Padua from 23 to 25 September 2019. The call for papers and the conference website are online now! The elections for the new SIGCHI-Italy chair were held between October 22 and 26, and the role has been appointed to Professor Maristella Matera of Polytechnic of Milan. Prof. Matera was one of the first group members since its foundation in 1996. Since her PhD, her research has focused on the intersection between web engineering and human-computer interaction, in particular on conceptual models designing systems for different platforms (web, mobile, internet of things). Since 2010 she is an Associate Professor in the ING / INF-05 sector and, in recent years, she contributed to the Polifactory, a maker space and fab lab, driven by the collaboration between Design and Mechanical Engineering professors. Her ideas on the group’s future include the reinforcement of the education in HCI, for both the Computer Science and the Computer Engineering degrees. Furthermore, the group will promote the research results in this area and it will strengthen the organized events, in synergy with other associations working on similar topics. The whole chapter thanks Massimo Zancanaro, the former chair, for his efforts and for the excellent work done in these years. 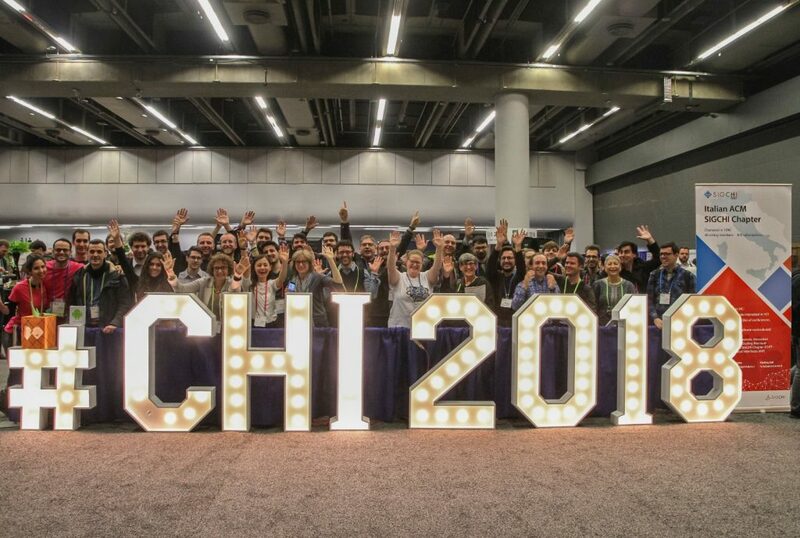 Many Italians researchers have gathered around the SIGCHI-Italy banner during CHI 2018 in Montreal, Canada. Here they are! We are proud to announce that Prof. Maria Francesca Costabile, received the SIGCHI Lifetime Service Award, a prestigious conferment granted to “individuals who have contributed to the growth and success of SIGCHI”. Maria Francesca is one of the founding members of the Italian Chapter of ACM SIGCHI, and served as the first Chair from 1996 to 2000. The whole group congratulates Francesca for such a remarkable achievement. Read more on the University of Bari website. It includes the workshop scheduling, the Research Paper sessions and the list of accepted Doctoral Consortium and Demo & Poster Papers. We thank all people that contributed to such a great programme!